Villa Urlovic is situated in the little old village of Dubravka in Konavle, Dubrovnik area on a very quiet and sunny location only 12 km from the coast, and about 40 minutes drive south of Dubrovnik. The house is traditionally furnished and spacious inside, with 2 double bedrooms, a single bedroom, bathroom, living room and fully equipped kitchen with dining room. Ideal for outdoor living, the villa enjoys small gardens with flowers, barbecue and a private pool. You can relax on the big terrace on a sun beds enjoying in a wonderful view of sea, mountains and Konavle valley at the same time. Close to Dubrovnik airport. Easy to find and nice quiet small agricultural village on the mountain side right beside the church. We spent a nice week in here. Hosts are very friendly and helpful. Consult them if you wish to find the quiet beaches. A short drive to Cavtat which is excellent place for a sunny and slow day. A delightful traditional property-stunning views. A thoroughly enjoyable holiday. We were met at Dubrovnik by a very friendly Stijepo. He took us to the villa which was a great help. It wasn't far from the airport (about a 25 minute drive along quiet roads). Once we got to the villa in the mountains the views were amazing. Stijepo explained everything to us in excellent English. The villa and pool were very relaxing. We met Stijepo's mum and dad on several occasions when we parked our car outside their house in Cavtat. They are lovely people who invited us in for drinks and lovely homegrown cherries, figs and homemade quince jelly. Being able to park outside their house in Cavtat was brilliant as we spent several evenings in restaurants in this beautiful little seaside town. We also got a boat from Cavtat to Dubrovnik which was amazing. The villa was situated very close to the Montenegro border. A day trip to Kotor was stunning with its old town and walk up the mountain. Many thanks again Stijepo and his mum and dad for making our holiday the best we have ever been on. A great location with wonderful views. Met by Stijepo at the airport & he took us to the villa. His other had made some pastries etc. He then proceeded to tell & show us around the property & tell us about the area. Nothing was too much trouble. How hospitable. The villa itself was adequate if only a little dated but in very nice condition & obviously very well kept. The pool was fine. The village itself was very quiet, however we did woken every morning by the church bells although it didn't spoil anything...who wouldn't want to wake up to the sun & superb views everyday! All in all thoroughly recommended, particularly the hospitality shown by the family as a whole. 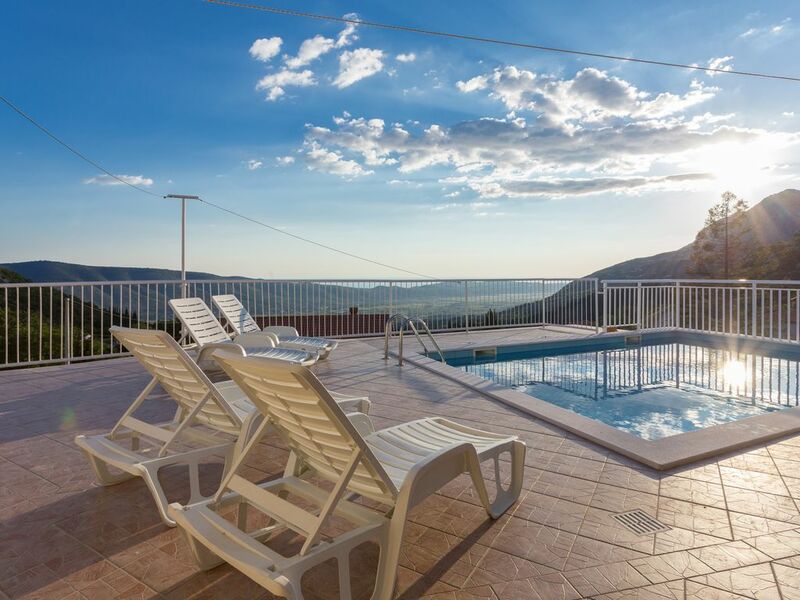 This villa is high up in the mountains of Dubravka and has everything that a family needs. It is private with good sized bedrooms and that all important AC that you need at the height of summer but with the mountain breeze often AC is not necessary. You will need a car for access and getting about. 30 minutes at most from the airport, the transfer is very easy and I will come on to this later. The villa is rustically charming and very traditional and we instantly felt that it was home from home. It is clean, bright and well appointed with everything that you would want for your stay. In a separate but very close outer building is a lovely BBQ area with a superb chimney style BBQ. Wood is provided in copious quantities. There is a pool and it is a good size. It is very clean and well maintained. Numerous sun beds are provided with table and chairs that we used to take breakfast on the terrace each day. There is also a lovely garden and you have private parking. The villa has beautiful views of the countryside, sea and mountains. Sunsets are astounding. You are within a village. The best bit about the villa is the owner and his family. Stijepo is the oldest son of the family and he met us at the airport and we followed him out to the villa. He told us all about the local area and what to do. I would advise that you listen to what he has to say as he knows what he is talking about. He did not let us down. We were given gifts of quince jelly, delicious cake and dried figs, all made by Anka, Stijepo's mum. They were all so tasty and what's more we were resupplied mid holiday with more. Luka is Stijepo's dad. He comes out at regular intervals and supplies fresh figs and pool maintenance etc. The family are so nice, so kind and so friendly. Nothing was too much trouble. Anything we needed was instantly taken care of. They live in nearby Cavtat and they will let you park at their apartments. Take them up on their offer. Parking anywhere else in Cavtat can be difficult. When we parked there each time we were invited in to their home and given home made juice and more of the delicious cake. I really can't over egg just how nice the family are. Places that we enjoyed include Molunat, Gruda, Dubrovnik, Celipi and Cavtat. The three island cruise is a must. We don't think you could be disappointed staying here. It is a very nice, quiet and well supported family villa that makes an excellent family retreat. We highly recommend this villa. If you are wanting a fantastic holiday in a beautiful rural setting then look no further..... Villa Urlovic is for you. Booking was the easiest we have experienced thanks to Stijepo's prompt response to all requests. He also met us at the airport with cakes and quince jelly and introduced us to the house and area. The Villa is in an amazing setting overlooking the village and is equipped more like a home than the usual holiday let .Roads empty of traffic enable easy access to the surrounding area with plenty of walks and beaches, Do visit the icecream man at Sokol Grad just down the road. He is an interesting character and very helpful, as was everyone we met. Sitting on the terrace with the barbecue fired up with g and t's in hand watching village life unfold before us was just one of the highlights of a great holiday. We had a wonderful time, Stijepo's mum made us some lovely cakes and Quince Jelly when we arrived, his dad brought us some figs mid-week! They can't have looked after us any better. We have stayed in lots of villa's in lots of different countries, and we think that the view/location of this one is by far and away the best that we've been in - mountains on 3 sides, sea view and a valley, goats and cows (with the little bells on) being brought down from the mountain in the early evening. Also a very well equipped kitchen. We had our two boys with us (age 8 and 13) on our first night there was a call from some of the local children - "do you play football?" and with that our boys were playing with the local boys and girls (similar ages) every evening. Perfect for us as they were occupied every evening and we got to enjoy a nice quiet glass of wine or two watching the fabulous sunset. Stijepo gave us some good tips on where to go - listen to him, he knows what he's talking about - he did offer to give us a parking space if we went to Cavtat, we didn't take him up on this offer and I wish that we had done - parking in the town was a nightmare! Recommend the fishing village too. Villa Urlovic is situated in the little old village of Dubravka in Konavle, Dubrovnik area on a very quit and sunny location only 15 km from the coast, and about 40 minutes drive south of Dubrovnik. You can relax on the big terrace on a sun beds enjoying in a wonderful view of sea, mountains and Konavle valley at the same time. The nearest restaurants are 5 km away in the village of Ljuta, the nearest market is 6 km away. Dubrovnik airport is located just 15 minutes from the villa and a full selection of restaurants, shops, bars and also nice beaches can be found in the charming small resort of Cavtat, 20 km north. Day trips can include spending a day strolling round the famous streets of Dubrovnik, or relaxing on the blissful coastline just a short drive away. You can also easily cross the border into Montenegro for the day and visit places such as Budva, Kotor and Sveti Stefan.